The New Year symbolizes new resolutions, with many involving weight loss. Fad diets come and go, but if there’s one nutrition plan you should stick to this year, it’s the Mediterranean Diet. 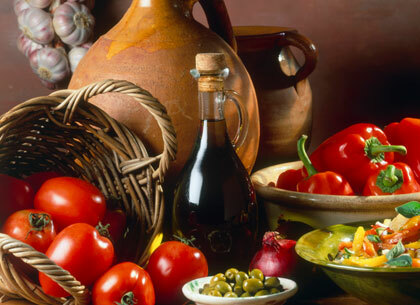 Last year, in a report published in the Journal of the American Medical Association, we learned that older adults who adopted the Mediterranean diet cut their risk of suffering a heart attack or stroke by nearly 30 percent over five years. The study, spanning seven years and examining more than 7,000 men and women between ages 55 and 80, suggested that a diet high in olive oil, fruits, vegetables, whole grains, and fish has therapeutic effects on the heart. Now, the same researchers have discovered yet another benefit from adopting this diet—it can lower the risk of developing peripheral artery disease. The leader of the study, Dr. Miguel Ruiz-Canela, claimed they discovered the correlation in one of the first studies of its kind to examine the association between nutrition and PAD, the illness that involves plaque buildup on arteries that can restrict blood flow throughout the body. Their new discovery, along with the host of previously discovered benefits, indicates that this diet might become more than just a passing fad. This is a great, easy recipe to make for dinner or just snack on when you get a craving. If you want to make it a full meal, add a serving of whole grain pasta. Toss all of the ingredients together and enjoy! Serves three.